We’ve long known that a worsening skilled labor shortage is impacting the home improvement industry, making it harder for businesses to thrive and grow — and even for homeowners to connect with professionals to finish home projects. But what’s actually at stake? What’s the tangible impact on business owners? And what are the real, workable solutions that stand to solve the problem and get us back on track? HomeAdvisor and Angie’s List teamed up to survey 800 home service professionals and interview key stakeholders to get the unique perspective of those hit hardest by the crisis. Here’s what home service professionals, students, educators, and even the leaders of HomeAdvisor and Angie’s List themselves have to say about the skilled labor shortage and what we can and should do to fix it. An aging skilled workforce is retiring, and young people aren’t pursuing careers to take their place. The resulting knowledge gap stands to cripple home improvement and infrastructure for years to come. Nearly 70 percent of pros responding to our skilled labor survey say they rarely or never see recent high school graduates joining the skilled trades. Further, respondents indicate that just 11 percent of candidates applying for open positions are between the ages of 18 and 24. Data support the point. 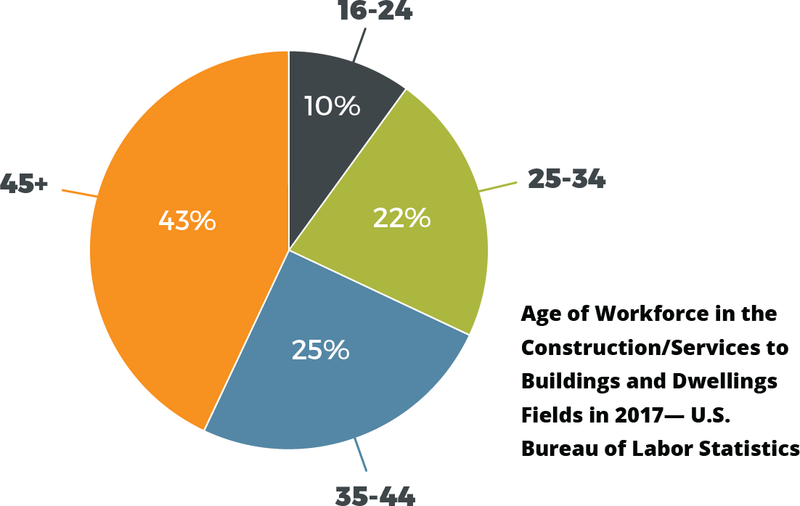 The median age for workers in construction and services to buildings and dwellings is 43 years old, according to the U.S. Bureau of Labor Statistics. And workers under the age of 25 make up just around 10 percent of that total workforce1. HomeAdvisor and Angie’s List see a similar trend: Less than 4 percent of the remodeler, electrician, HVAC, plumber and builder business owners in our networks are between the ages of 18 and 24 — and just 8 percent of roofers. The implications are far-reaching. As more workers age out of the skilled labor trades — and far fewer come in to replace them — a critical talent pipeline is diminished. The outcome is that we fail to pass on the fundamental knowledge and skills needed to keep our homes and infrastructure in good working order, not just in the near term but well into the future. A shortage of skilled laborers is restricting business operations and growth in the trades. Business owners in the home services are struggling to find and hire skilled workers. In fact, more than half of respondents participating in our 2018 skilled labor survey indicate that a lack of available workforce is stunting the growth of their businesses — and more than two-thirds say the labor shortage is getting worse as demand for skilled laborers is getting stronger. 70 percent of respondents say they could grow their businesses if they could only find more quality skilled workers. What’s more, over half of professionals indicate that they are either currently turning down jobs or that they will have to turn down jobs in the next two years as a direct result of the skilled labor shortage. This not only makes it difficult for businesses to grow to their full potential, but it also makes it difficult for homeowners to connect with pros. Consequently, it’s led to delayed home and building projects, shrinking home inventories, and inflated home prices and home project costs across the nation. With fewer young people entering the trades, the situation only stands to worsen. In the near term, businesses must create internal solutions to combat the impacts of the skilled labor shortage. Recruitment and retention are more important than ever. Over 50 percent of survey respondents say they feel understaffed. What’s more, 63 percent of respondents who’ve hired fewer workers than planned say it’s because they couldn’t find workers to fill open positions.Professionals primarily report using flexible schedules, a fun work environment and above-average wages to try and attract skilled laborers to work for their businesses. But 54 percent say they’re struggling to attract skilled laborers even though they’re paying a higher wage. Interestingly, professionals aren’t looking for candidates with extensive experience. Over 90 percent say a strong work ethic, a positive attitude, physical ability and endurance, and a desire to learn the trade are most important in a candidate. And 80 percent say their jobs require zero to three years’ experience in the field. Word of mouth plays the biggest role in recruiting. Nearly 75 percent of pros report using referrals over online job postings, classified ads and other methods by a large margin. This, coupled with the fact that many businesses have resorted to recruiting straight from competitors’ job sites, only serves to underscore the importance of keeping established employees happy. Ultimately, until the skilled labor shortage is addressed on a grander scale, it will be up to employers to create internal solutions to combat the impacts. Women are an untapped workforce. Focused efforts should be made to recruit more women into the skilled labor trades. Women make up nearly half of the American workforce. However, a lack of exposure to skilled labor careers, in combination with a lack of focused female recruitment and issues such as sexual discrimination and harassment, has traditionally curtailed the number of women working in the skilled labor trades. Currently, women represent just 1 percent of HVAC and refrigeration mechanics and installers and just 7 percent of construction managers, according to the U.S. Department of Labor2.Nearly half of pros surveyed think increasing the number of women in the skilled labor trades would have a moderate to major impact on the skilled labor shortage. And stakeholders agree that efforts to close the skills gap should include programs aimed specifically to recruit women into careers in the skilled labor trades. Solutions may include cooperation with existing organizations such as the National Association of Women in Construction and CalApprenticeship, the creation of women’s trade and student associations, grant and scholarship programs, and mentorships, among other concerted efforts. Apprenticeship programs and vocational education will play a key role in closing the skills gap and solving the skilled labor shortage. Of pros surveyed, 80 percent believe putting vocational programs back in high schools will have a moderate to major effect on the labor shortage — and roughly two-thirds think offering scholarships for trade schools would do the same.A lack of exposure to the skilled labor careers has proven to be a barrier to entry, and a lack of information has led to a general lack of interest in the skilled labor trades. Reforming existing educational programs to better emphasize these careers — and re-introducing vocational education and apprenticeship programs into school curriculums — will have an immediate and far-reaching effect that will serve to facilitate a broader long-term solution. Of course, stakeholders specify that cost and curriculum will present a unique set of challenges in expanding vocational education and apprenticeship programs. And since many apprenticeship programs require participants to be 18 years of age — and since there are laws and rules regarding class credits — policy changes and clarifications may be required to make the best use of existing resources. Stakeholders agree that businesses and schools will have to work together to address these challenges and increase interest from the outset. Educational opportunities also exist outside of high schools. There is a benefit to introducing skilled labor careers at the elementary and middle school levels, when students begin to form career interests and identities. And integrating trade education at the university level can introduce opportunities to advanced students seeking a clear direction for the future. A perception problem is largely to blame for the current situation — and it’s been catalyzed by an enduring emphasis on higher education. More than 60 percent of survey respondents agree that there’s a lack of respect for blue-collar work in America. Stakeholders concur that it’s largely an unintended consequence of our nation’s emphasis on the importance of a four-year college degree. Decades ago, the American educational system began to phase out vocational classes and encourage all students to pursue a college education. As a result, students who did not grow up in households among skilled labor workers were given little exposure to career options and mentors in the skilled labor trades. As blue-collar jobs were deemphasized, the notion that vocational education is less desirable than higher education perpetuated. “In the United States, career and technical education is often stigmatized, and there is a widespread perception that career and technical centers provide a lower quality education or that students who attend such schools are less capable or have lower aspirations,” explains the Great Schools Partnership — a nonprofit school-support organization in New England3. Among the greatest misconceptions are that the trades offer little chance for high salaries and upward mobility and that the work is physically hard but not mentally challenging. In truth, many of today’s trade laborers make over six figures per year. What’s more, the trades offer the opportunity to not only use your mind but also to own and run your own business — a primary motivator for the millennial generation and a key reason home service professionals enter the profession, according to past HomeAdvisor surveys4. To effectively implement solutions to bridge the skills gap, we’ll need to alter deep-seated perceptions about the skilled labor trades and the importance of a four-year college degree. Nearly two-thirds of pros surveyed agree that an improved perception of blue-collar work would have a moderate to major impact on the labor shortage. Of course, the stigma surrounding the skilled labor trades was cultivated over several decades, and changing that perception won’t happen overnight. So, the question is: Where do we start? What might have the greatest, most immediate impact not just in attracting young people to the labor trades, but also in re-framing skilled labor careers as aspirational paths to pursue and be proud of? Stakeholders agree that it starts with a partnership between professionals and educators to generate greater exposure, hands-on training and messaging in the schools — and that even Hollywood, corporations and mass media can play an important role in expediting the outcome. Emphasizing entrepreneurial and monetary opportunities will go a long way in improvingperception and generating interest in the skilled labor trades. With our nation’s emphasis on the importance of a four-year college degree, more and more students are graduating tens of thousands of dollars in debt with no clear career path. The cost of a moderately priced in-state public college, plus room and board, averaged $20,770 for the 2017-2018 academic year, according to a recent College Board college pricing survey5. That means the average four-year student will pay more than $80,000 to get a college degree before the accrual of student loan interest. Remarkably, according to a study by organizational consulting firm Korn Ferry6, 2018 college graduates in the United States will make an average of $50,390 per year. This is roughly the salary of a plumber or electrician with journeyman status, which is typically attained after four to five years of paid, on-the-job training — and without the $80,000 price tag of the typical college degree. Mobility and entrepreneurship opportunities are further compelling. Skilled laborers such as plumbers and electricians can move on to become masters of their craft, making upwards of $90,000, according to HomeAdvisor’s Salary Guides. And professionals in just about any skilled labor field can rise through the ranks to manage teams and projects — and even own and grow their own businesses. The skilled labor shortage can’t be solved in a vacuum; it’s going to take a collaborative effort to find an integrated solution. A shortage of skilled labor in the home improvement trades affects all of us — from students and families to professionals and business owners to anyone who owns or lives in a home or apartment. And it’s going to take a concerted, collaborative effort among industry stakeholders to solve it. The good news is that we’ve seen it work in other nations, such as Switzerland, where cooperating stakeholders have carefully crafted a proven apprenticeship model that gives students practical experience and meets the evolving needs of businesses. (Under the Swiss model, 70 percent of all students choose apprenticeships and most CEOs have been apprentices7.) And pros, educators, businesses and government entities have acknowledged there is a problem and expressed a willingness — and a determination — to act across the United States. Nearly half of pros surveyed say they would be personally willing to work with schools to help increase the availability of skilled laborers in their trade. And many other stakeholders have already begun to consider and implement programs to address the growing skills gap and increase the exposure young people get to varied careers. There’s no denying the fact that the greatest challenge we face currently is getting more young people interested in joining the skilled labor trades. And if we fail to act now, we fail future generations — leaving them without the critical resources necessary to build and maintain the homes and infrastructure we’ve come to take for granted. Only by working together — not only to address the stigma attached to skilled labor head-on but also to develop practical, scalable policies and programs to meet the needs of students, businesses and society as a whole — can we truly close the skills gap and ensure an unbroken future. Data included in Trade Labor survey was developed by the internal research team for HomeAdvisor and Angie’s List. The survey was conducted from April 9-September 4 among over 800 professionals in the HomeAdvisor and Angie’s List networks. Additionally, the service professional age is based on the average age of business owners approved into the HomeAdvisor network as of April 2018 and the average age of business owners who are also advertisers in the Angie’s List network as of April 2018. HomeAdvisor® is a digital marketplace evolving the way homeowners connect with service professionals to complete home projects. With HomeAdvisor’s on-demand platform, homeowners can find and vet local, prescreened home service professionals; view average home project costs using True Cost Guide; and instantly book appointments online or through HomeAdvisor’s award-winning mobile app, which is compatible with all iOS, Android and virtual assistants, including Amazon Echo. HomeAdvisor is based in Golden, Colo., and is an operating business of ANGI Homeservices (NASDAQ: ANGI). For over two decades, Angie’s List® has provided trusted reviews and information to help millions of consumers make smart hiring decisions. Angie’s List offers more than 10 million verified reviews in over 700 service categories, providing its members a credible resource for researching and comparing local service providers. Angie’s List is based in Indianapolis, Ind. and is an operating business of ANGI Homeservices (NASDAQ: ANGI).